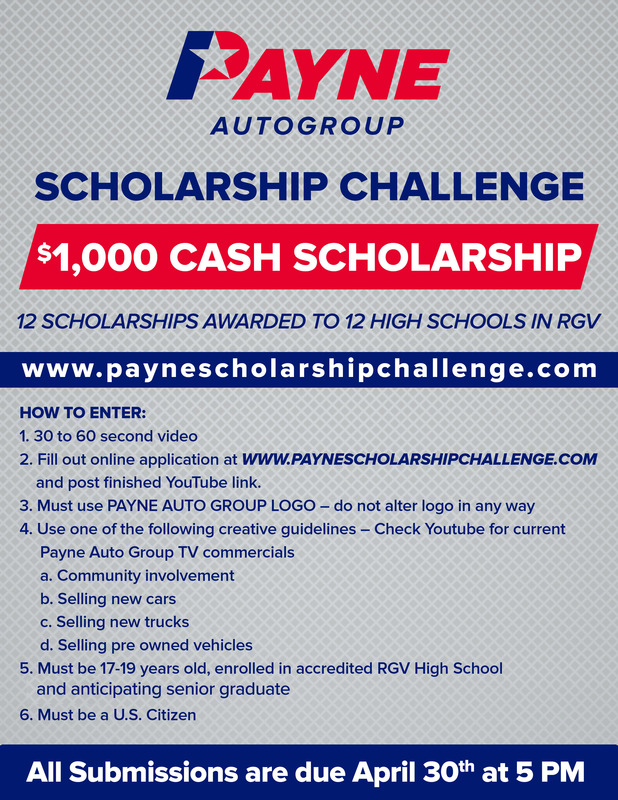 It’s time for the annual Payne Auto Group Scholarship Challenge! Are you a high school senior or 2019 graduating senior? You can have the change to win a $1,000 scholarship for the college of your choice! MUST use one of the following creative guidelines for the video: community involvement, selling new cars, selling new trucks, selling preowned vehicles. Once finished with your video, upload it to YouTube. INCLUDE the YouTube link with your scholarship video entry. All submissions are due April 30, 2019 at 5 p.m. Check out our community involvement here! To keep up with future promotions and events, follow Payne Auto Group on Facebook and Instagram! Previous articleIt’s Rodeo Time at the Payne Auto Group! Next articleAlfresco Weslaco: Valentine’s Day!